Dr. Craigen is a graduate of Rutgers School of Dental Medicine in Newark, New Jersey. He received his undergraduate degree in Biology from Amherst College and his Masters Degree in Biomedical Sciences from Rutgers Graduate School of Biomedical Sciences. 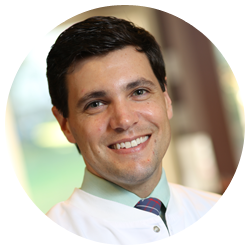 After graduating from Rutgers School of Dental Medicine Dr. Craigen began his dental career as a general dentist resident at the New York Methodist Hospital in Brooklyn, NY. While there he was trained in a wide array of dentistry, including oral surgical procedures, molar endodontics, pediatric dentistry and more. With a range of skills and knowledge of cutting-edge technology, he strives to offer modern services with the comfort of his patients in mind. His ultimate goal is to offer high quality care for a healthy, beautiful smile, in a compassionate environment. He is well versed in meeting the needs of his patients whether the case is complex or routine. Dr. Craigen specializes in the preservation of a healthy mouth, as well as the art and dynamics of a beautiful smile. In 2014 he received the Dental Student Award given by the American Association of Oral and Maxillofacial Surgeons. He was also a member of the Gamma Pi Delta Prosthodontic Honor Society, and was a member of the Dean’s List during his time at Rutgers School of Dental Medicine. He is a current member of the American Dental Association, the Massachusetts Dental Society, and the Academy of General Dentistry. Dr. Craigen worked at Four Corners Regional Health Center as an Extern in the Indian Health Service. He administered dental services to underserved members of the Navajo community. While there he performed tooth extractions, endodontic therapy, restorations, and sealants. When Dr. Craigen is not practicing dentistry he enjoys spending time reading, playing hockey, and going golfing.